Independent Test Validates Meru 802.11ac Wi-Fi as 40% Faster than Cisco and 100% Faster than Aruba. 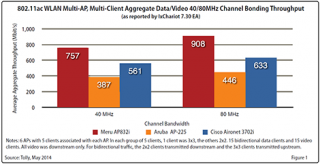 The result of extensive 802.11ac competitive testing, conducted by leading independent laboratory The Tolly Group, showed Meru outperformed Cisco in seven of the eight and Aruba in all multi-AP, multi-client test cases. The tests showed conclusively that the overall performance of the 802.11ac Meru AP832 Wi-Fi access point was far superior to the comparable Cisco® AP3702i and Aruba® AP225. To find out more click here to see the article on the MERU website. Or check out the Meru videos found here.